No Matter What You Think You Know, The Situation Is Often Different Than You Suspect. Consider the Charles/Diana/Camilla love triangle as an example. Prince Charles and Princess Diana divorced almost twenty-three years ago, and the Prince has been married to Camilla, Duchess of Cornwall, for almost fourteen years. 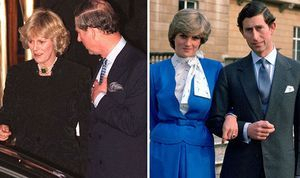 Still, citing the long-term affair between Charles and Camilla that helped destroy the Wales’ marriage, many aren’t in favor of Camilla taking the title that Diana was once destined for. For many years, Camilla was seen as "The Rottweiler" who wouldn't let the Prince go and singlehandedly destroyed Charles and Diana's marriage. Just as Camilla has sidestepped the title of Princess of Wales—which, technically, she is—to be known by the lesser title of Duchess of Cornwall, some still hope she will choose the title of Princess Consort when Charles ascends the throne, becoming known as Princess Camilla, rather than Queen Camilla. However, Camilla is far from the sole reason Charles and Diana divorced. For many years, people looked at the fact that there was an affair, automatically blamed Charles, and that was all they saw. But what happened to the Wales marriage was multifactorial. The Prince’s relationships with both women were broken by a nightmare of neverending tragedies. 1.) Camilla was always the true love Charles wooed and lost. Camilla dated her first husband, Andrew Parker Bowles, off and on for several years, but he broke it off with her in 1970. That was when she was first introduced to the Prince and they started dating. Charles thought she was the right girl then, but when he got transferred overseas with the Royal Navy in 1973, he stopped calling or writing Camilla. Thinking the Prince had dumped her, Camilla went back to Parker Bowles, who proposed to her. 2.) Charles was brokenhearted at hearing of Camilla’s marriage; and then, that marriage didn’t go well. He wrote about his sorrow in a letter to his uncle at the time. But the marriage had already happened, and it was too late. Charles had no one to blame but himself. He had listened to other members of his family, who didn’t consider Camilla suitable as a bride. Then, not long into the marriage, Andrew Parker Bowles moved into an apartment in London during the work week, leaving his wife alone with their children in the country. Parker Bowles had numerous affairs, and Camilla was unhappy. She and Charles found each other again and resumed their affair. But, if Charles had felt stuck before, he was really stuck now. No one in the royal family was permitted to marry a divorced person, least of all the future king. Even if Camilla left Parker Bowles, they still couldn’t be together. He and Camilla enjoyed the time they had, knowing that Charles was expected to marry and they would have to part. 3.) Charles got terrible advice from the man he idealized the most. Look at the successful marriages of younger royals like Prince Edward and Countess Sophie, Prince William and Duchess Kate, and Prince Harry and Duchess Meghan. Each of these royal men, raised in modern times, dated the woman he thought he might marry for at least a year—eight years, in the case of Prince William!—and waited for someone he felt a deep friendship for and knew he got on well with. Unfortunately, Lord Louis Mountbatten, Charles’s great uncle, who was almost a substitute father for Prince Charles and whom the teenaged Charles idolized, didn’t give him any of this sort of advice for choosing a royal bride. Instead, he told Charles the most important thing was that the girl be young, sweet, and demure, from a suitable family, and that she not have had many boyfriends. Mountbatten believed that if a girl had happy love affairs to look back on, she would be more likely to feel unhappy in a royal marriage, and this would create trouble. So, instead of being grounded in any real values that make a marriage work, Charles was looking at superficialities like how old his dates were and whether they seemed sweet and shy or not. 4.) Charles didn’t choose Diana. The press, the public, and Prince Philip did. As time went on, Charles felt more and more pressure to choose someone, walk down the aisle, and produce heirs. This makes for a terrible way to choose a wife. Diana, with her tall, blonde, movie-star good looks, and the way she had of charming the camera, the reporters, and the public, became more popular than any woman Charles had dated previously. In no time, everyone on both sides of the Atlantic hoped she would be the one. The public anointed Diana early on, largely because of the press buildup she received. When a woman is tall, thin, young, and beautiful, we all believe good things about her, based solely on physical appearance. Reporters understood this, and knew how to write about Diana and photograph her so that she sold papers. Prince Philip was concerned there would be a scandal if Charles dated her and then dropped her, so he pressured his son to make a quick decision. Faced with losing Diana if he took the time he needed to get to know her better, Charles popped the question … and the result was disaster. The couple only met thirteen times before they got engaged, not nearly enough time to find out whether they really were compatible or not. Charles went for someone the public approved of and simply hoped he would fall in love with her, rather than waiting to find out who each other really was, or waiting for someone he really could have made a life with. 5.) Charles was too young and unsure of himself to stand up to his family and to the public. In his fifties and sixties, Charles finally found the backbone to buck tradition, continue to see Camilla even though the British public disapproved of her, and even marry her. Slowly public acceptance has come around, the monarchy hasn’t ended, and the sky hasn’t fallen. It could have happened back then, too. What was missing was Charles’s conviction that he himself was entitled to happiness with the woman he chose to marry, rather than his father, the press, and the public. Charles was the one who had to live most intimately with the choice. Unfortunately, when we’re young, approval seems like everything. If Charles wanted to get married anyway because he wanted children, he could have been more honest, and ended up with a woman who could have accepted the arrangement he wanted. Lastly, if he’d stood up to papa and refused to be rushed, he might have seen the signs of Diana’s mental illness before he proposed to her. Almost no one thinks this way when they’re young, however, and the ability to stand up for oneself and think for oneself generally develops because, and not before, we’ve made a terrible mistake or two. 6.) Sadly, Princess Diana was truly mentally ill.
Borderline personality disorder can be tough to spot if you know a person only socially. Having been raised by someone with the illness, I can’t tell you how many times my mother could hold it together in order to appear sweet, charming, lively, and adorable in public, only to abuse me in private. I remember feeling desperate as a child, because I knew if I told, no one would ever believe me. Prince Charles had too much class to ever expose the tumult in the royal household in an interview, but even if he had wanted to, he probably recognized that if he told the truth, people would think he was lying. The kind of intense suffering and acting out he would have described simply did not tally with our images of the kind, beautiful Princess who graced public events and the newspapers every day, always ready with a smile, a hug, or a joke. BPD sufferers run the gamut between being so symptomatic, like Marilyn Monroe or early 80’s supermodel Gia Carangi, that the casual observer could tell they had emotional problems, to being more high-functioning and able to hide their emotional distress for long periods of time in public. Princess Diana tended toward the more high-functioning end of the scale, but even she had her public breakdowns where the cameras caught her crying. Those with BPD tend to show more symptoms the more you are with the person and the better you know them. Often from a difficult family background, they tend to weave fantasies about how a romantic relationship will make them feel as loved as they always needed to feel, but never did. But, at the same time, borderlines have only a hazy sense of who they really are as a person, and they have a deep sense of self-loathing and shame. Each sufferer has a long history of never feeling good enough. They enter a relationship expecting to be slighted—as Diana certainly was when she became aware her fiancé was having a tough time saying goodbye to Camilla Parker Bowles. This kind of situation would be difficult even for the most solid soul, but Diana, already needy and sensitive to any kind of rejection, believing from childhood that she simply was not good enough, could not think clearly about the situation at all. All she could do was react. Binging and purging, raging, and episodes of self-harm are common ways borderlines fly into intense emotion and react. Most of us, disliking our babysitter, wouldn’t put pins in her chair. Most of us, having a disagreement with our stepmom, wouldn’t push her down the stairs in a rage. (Both of these things, Diana admitted to doing.) Most of us, faced with our husband wanting to go out riding when we hoped he would stay in with us, wouldn’t become so upset we throw ourselves down a flight of stairs. Emotions in BPD are biochemically heightened, so that a small disappointment to you and me can feel as traumatic to a borderline as if someone’s just died. This is the difference between Diana and a person without BPD. Bulimia was another symptom of the BPD, not Diana’s whole problem. Diana believed that anyone would react this way. But, the reality is that to live with someone who breaks down in uncontrollable tears and suffering, when you have no idea what you did to upset the person, or when you are just trying to leave to go to your job or to some outing you’ve had planned for months, is highly distressing and upsetting. This was daily life in the Wales household. 7.) Little was known about BPD in the early eighties. In the early 1980’s, pockets of knowledge about BPD existed, where expert therapists could make slow but excellent progress with a patient who was dedicated and had good family support. Rachel Reiland is one example of a BPD patient who made a full recovery in the 1980’s. But therapist Marsha Linehan had yet to write her seminal book on BPD, and her definitive treatment for the illness, dialectical behavior therapy, had yet to be invented. The explosion of good books about the disorder that reached the public in the 1990’s and 2000’s hadn’t happened yet. Prince Charles had never heard of the illness, and it’s quite possible Diana’s doctors hadn’t, either. Diana often lied about her symptoms, not sharing with her therapists that she had bulimia, which made proper diagnosis difficult. And without full knowledge of what you are dealing with, marriage to a person with BPD will be miserable at best, and impossible at worst. Diana and her family simply didn’t have access to competent help. These days, the best treatments for BPD include help for the family as well as the patient. If Charles and Diana could have received modern information and treatment then, their story might have had a different ending. If Charles had understood his wife had a diagnosable, treatable mental illness, no doubt he would have educated himself about it instead of seeking comfort from Camilla. If Charles, the Queen, and Prince Phillip had had access to full information about the illness, no doubt the family would have pulled together, the Palace would have insisted that Diana cooperate with treatment, and she would have gotten the kind of support she really needed. What a story that would have been! The fact that the Palace completely missed any information about BPD in the 80's demonstrates how little it was known and understood then. If a correct diagnosis eludes the Prince and Princess of Wales, two of the most privileged people in the world, the right information must be muddled, indeed. A doctor who knew about the illness might have screened Diana for it more carefully. 8.) As it was, Diana’s outbursts and mood swings made the marriage impossible. With BPD, a person feels worthless, but doesn’t want to feel this way, so they have a tendency to back down from a challenge and then blame someone else for making them do it. They tend to make the facts fit their feelings, instead of being honest about facts and remembering them clearly. Then they get upset, and when a borderline is upset, be prepared for a lot of extreme, dramatic behavior. A person with BPD is less able to calm themselves down, think clearly, and control themselves than the average person. Screaming, crying, and rages ensued, ending up in scenes like Diana crying in the bathroom while Prince William shoved her tissues under the door, begging her not to be sad. Someone without BPD could notice how they were upsetting their child and pull themselves together. Diana could not. So the things that upset Diana the most made family life more and more unbearable. Prince Charles found himself completely at a loss, and probably felt very distressed at what was happening. It wasn’t only Diana who needed someone calm and comforting to come home to; as in any marriage, Charles did, too. That is a main reason most of us get married. With someone so volatile at home and no way to make sense of the situation, he needed a sounding board and someone to lean on. As is so often the case with BPD, Diana drove Charles back to Camilla, even though it was the last thing she wanted or meant to do. This phenomenon is well known and one of the great tragedies of BPD. This chain reaction of perfect disasters blew into the perfect storm that was Charles and Diana’s marriage. It was always destined to end unhappily. Charles ended up running from the marriage, looking for comfort and shelter, and Diana did, too, seeing several men secretly both during and after the marriage. However, through it all, Camilla was the boulder Charles leaned on, and that is the definition of being Queen: the solid, loving, reliable helpmate and soul mate of the King. Camilla has certainly met that definition for most of the last fifty years. Rather than painting her as the person who wouldn’t let go and ruined the Wales marriage all on her own, hopefully Britain by now realizes the position all three in this star-crossed love triangle were really in, and accepts Camilla, when the time comes, by her true title of Queen. My own situation affair situation bore some similarities to this one. So did one I encountered in the workplace once. I worked in a small business owned by a husband and wife. All I was aware of at first was that the husband had moved out of his home and into an apartment with another young woman who worked for the couple. Everyone shook their heads and clucked their tongues. Then rumors started that the wife was a drinker. When the husband left the business suddenly, leaving me to fill his job, I soon discovered that the rumors were true when the wife started drunk-dialing every employee in the business and drinking at work. Her behavior sunk the business, and in trying to deal with it, I realized I couldn't make her stop drinking any more than the husband could have, and it was no wonder he had had to leave. He eventually married his affair partner; they opened their own business together, she nursed him through cancer, and they have two children and a healthy, happy family. I used to be very judgmental whenever I became aware of any instance of infidelity. Now I realize that snap judgments have more to do with what we thought we knew about the couple, and any insecurities we ourselves might have about being cheated on, than what the reality is for the couple, and withholding judgment until we know all the facts is always a good idea.